Unless you've been living in a cave, everyone reading this has heard of – and most likely consumed – one of the many “energy drinks” out there today. It is a segment of the soft drink industry that has grown more then Austrian Dietrich Mateschitz could have ever envisioned when he introduced a little $2 can of dynamite called Red Bull to the United States back in 1997. In 2006, the energy drink market generated nearly $4 billion in U.S. sales, much of that going to Red Bull, which holds by some estimations as much as 47 percent market share. O.K., so about now you must be asking what little cans of caffeinated soda water have to do with aviation. Plenty, according to this great, great story from Air and Space Smithsonian Magazine about Mateschitz's Flying Bulls Collection. Today, the Flying Bulls' ever-growing collection comprises a North American T-28B Trojan, a North American B-25J Mitchell, a Cessna C208 Amphibian Caravan, a Vought F4U-4 Corsair, five Fairchild-Dornier Alpha Jets, a Pilatus Turbo Porter PC-6/B2-H4, a Pitts S2B, a Bell AH-1Z Cobra helicopter, race pilot Lefty Gardner's old Lockheed P-38 Lightning, a Fairchild PT-19, Boeing Stearman, and the flagship, a perfectly refurbished Douglas DC-6B. At this year's AirPower 2005, Austria's largest airshow, 250,000 people came to watch the Flying Bulls fly and display their hardware. There are also Red Bull-branded aircraft on the Red Bull Air Racing World Series circuit. The flashy flying and the gorgeous airplanes are evidence of Mateschitz keeping tight control on how his brand is presented to the world at large. He markets the energy drink directly to participants and hangers-on at extreme sports events, airshows featuring his aerobatic racing team, and the Formula 1 auto racing circuit. As one who enjoys a career in advertising as it relates to aviation businesses, I have to shower the marketing team Mateschitz has put together with major league kudos. He's built an entire industry around those microcans of energy, and with his Flying Bulls Collection, he keeps the brand name out there, going fast, just like the people who drink those little cans several times a day. I will never forget the first time I drank a Red Bull. It was about 300 degrees in Fresno, and I pounded those few ounces of liquid down in less then a second flat. It was gone before I knew it, and my first thought was that at TWO BUCKS A CAN, who the hell would ever buy this overpriced stuff more then once? Silently, to myself, I predicted the tiny can of energy would be a passing fad, and that the only way this juiced drink had a future was if they dropped the price to .79 cents and if it actually got you seriously wired. To me, it was D.O.A., being a too expensive drink in a can too small, with a bunch of ingredients nobody had ever heard of. Fuggitaboudit, I said to no one...Red Bull was toast. Um, well, for the record, I was obviously way, WAY wrong on Red Bull. They are still two bucks a can, I am still not sure if they get me wired, but the world slams back 'The Bull” in record numbers...so much in fact, that an entire new world of cocktails has been invented featuring Red Bull as the mixer so you can party all night until the cows return to the dwelling. I've got just three words I'd like to say to Dietrich should we ever meet: Great. Job. Dude. FYI: Hattip to airliners.net, the class act of aviation photography on the web. 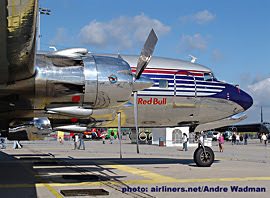 They have a long and very good list of Flying Bulls Collection photos, found here.